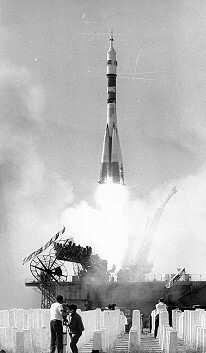 Launch from the Baikonur Cosmodrome; landing with Soyuz TM-5 spacecraft 160 km southeast of Dzheskasgan. 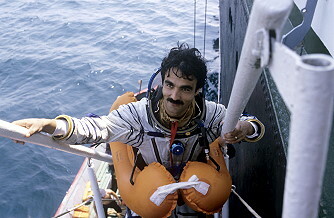 Abdulahad Momand became the first cosmonaut from Afghanistan. 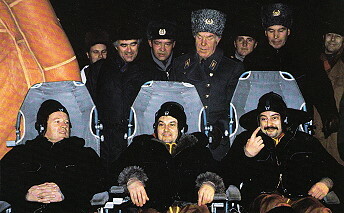 The crew had a unique makeup, with a Commander (Vladimir Lyakhov) who had been trained to fly a Soyuz TM solo in the event a rescue ship needed to be sent to recover two cosmonauts from Mir. 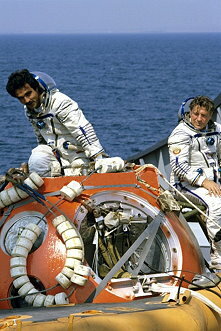 Onboard the spacecraft was no flight engineer, but two inexperienced Research Cosmonauts. 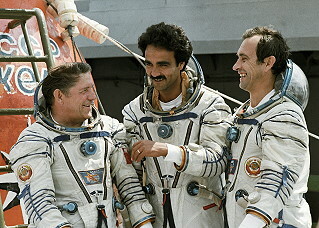 One was Valeri Polyakov, who remained aboard Mir with Vladimir Titov and Musa Manarov to monitor their health during the final months of their planned year-long stay. 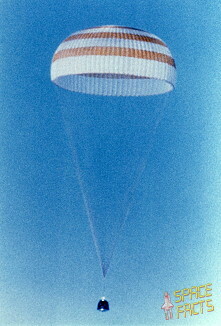 The Soyuz was placed in an initial orbit of 195 x 228 km at 51.57 deg. It then maneuvered to a 235 x 259 km orbit. 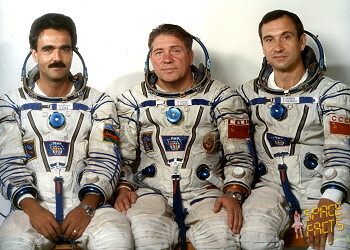 Following a two day solo flight Soyuz TM-6 docked with Mir-Kvant-Soyuz TM-5 on August 31, 1988. 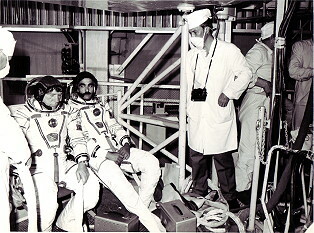 Scientific work with the third resident crew was done. 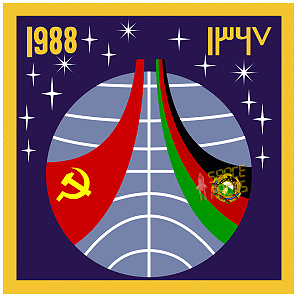 This included Earth observation, materials sciences and medical research (including observation of earthquake regions, searching for mineral ressources). 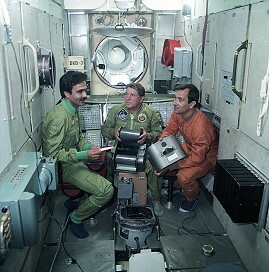 Topographic camera Kate 140, the MKS-M spectrometer, the Spektr 256 analysator and a handcamera were used during the Shamshed experiment. 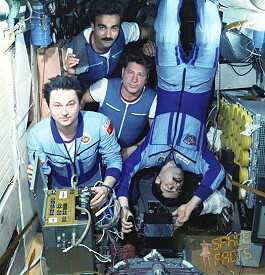 Medical experiment included studying of movementproblems in minor gravitation. 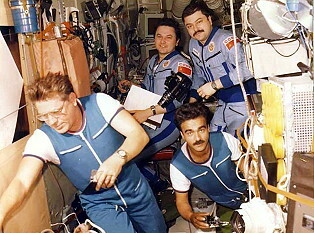 Valeri Polyakov stayed on board and became member of the third resident crew. 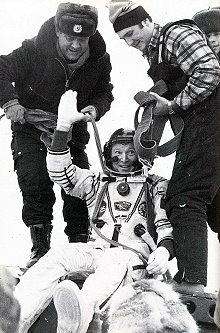 During descent they suffered a computer software problem combined with a sensor problem. 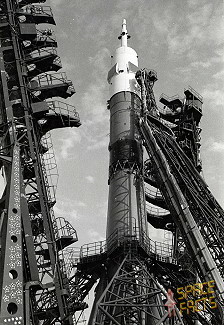 The deorbit engine on the Soyuz TM-5 spacecraft which was to propel them into atmospheric reentry, did not behave as expected. 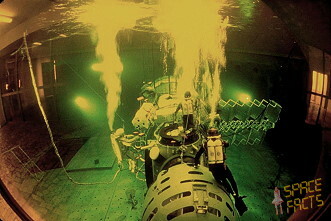 During an attempted burn, the computer shut off the engines prematurely, believing the spacecraft was out of alignment. 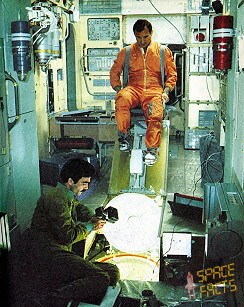 Vladimir Lyakhov determined that they were not, in fact, out of alignment, and asserted that the problem was caused by conflicting signals picked up by the alignment sensors caused by solar glare. With the problem apparently solved, two orbits later he restarted to deorbit engines. But the engines shut off again. 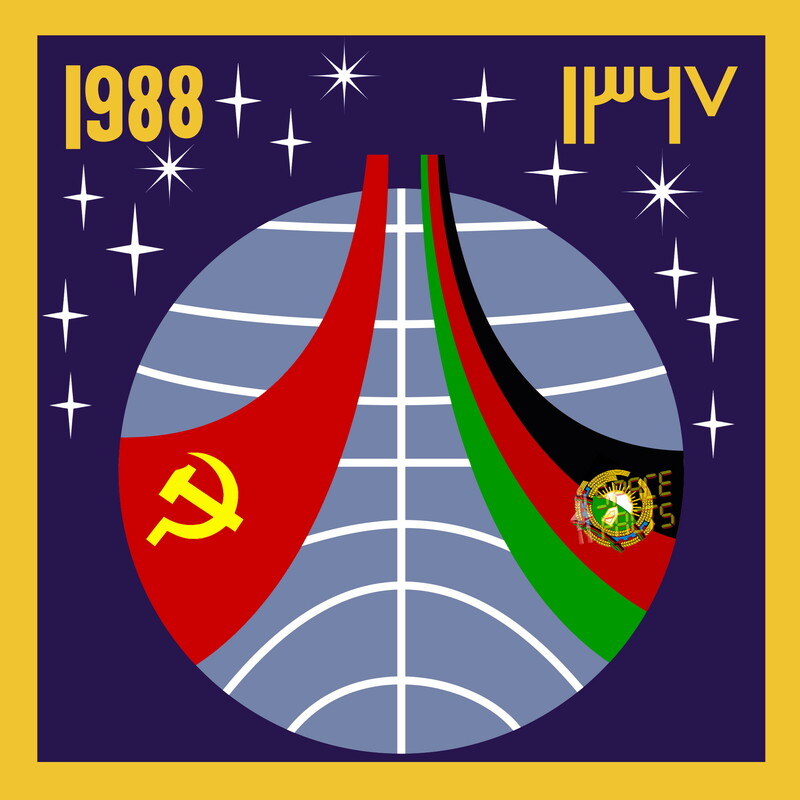 The flight director decided that they would have to remain in orbit an extra day (a full revolution of the Earth), so they could determine what the problem was. 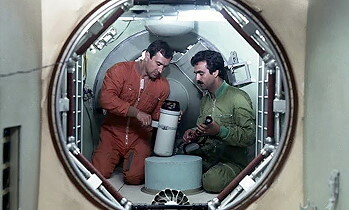 During this time it was realised that during the second attempted engine burn, the computer had tried to execute the program which was used to dock with Mir several months earlier during the stay of the second resident crew. 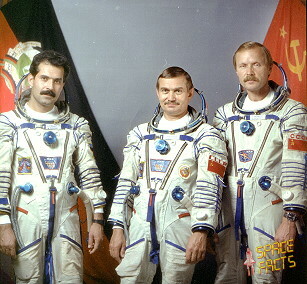 After reprogramming the computer, the next attempt was successful, and the crew safely landed on September 07, 1988. 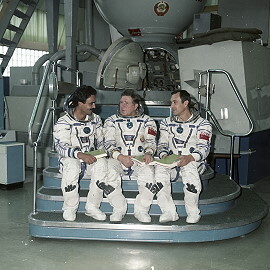 Valeri Polyakov landed on April 27, 1989 at 02:57:58 UTC with Soyuz TM-7 spacecraft. Last update on August 29, 2018.